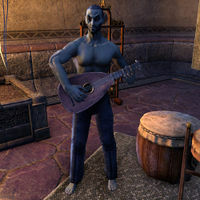 Mrylav Aralor is a Dunmer bard who can be found in Saint Delyn Waistworks in Vivec City. He has no unique dialogue. Prior to the Homestead update, he could be found at The Ebony Flask inn in Ebonheart. This page was last modified on 2 July 2018, at 05:30.